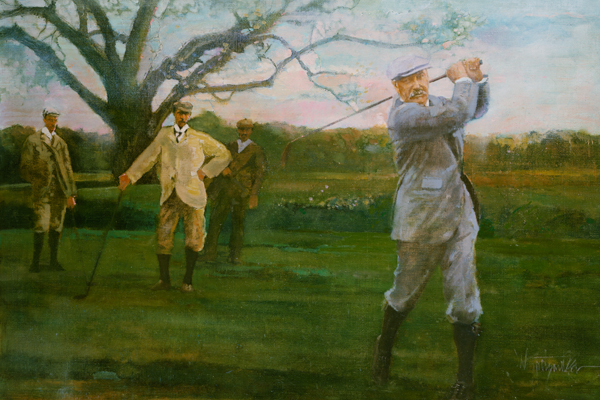 About CB MacDonald: Charles Blair Macdonald (November 14, 1855 – April 21, 1939) was a major figure in early American golf. He built the first 18-hole course in the United States, was a driving force in the founding of the United States Golf Association won the first U.S. Amateur championship, and later built some of the most influential golf courses in the United States, to the extent that he is considered the father of American golf course architecture. He is a member of the World Golf Hall of Fame. In 1900, Macdonald left Chicago to live in New York, becoming a partner in the Wall Street brokerage firm of C.D. Barnet (through mergers, now Smith Barney). With only a couple of exceptions, most golf courses in the U.S. at that time were laid out in rudimentary fashion, with little strategy required of the golfer. Macdonald, by virtue of his experiences at St Andrews and later trips to Great Britain, was determined (not immodestly) to build the most noteworthy course outside the British Isles. He searched Long Island for a suitable site to emulate the classic seaside links of Scotland, and eventually settled on a site in Southampton,New York (near Shinnecock Hills Golf Club) in 1906. In 1908, he organized a group of 70 founders to contribute $1,000 each, and th National Golf Links of America opened for play in 1909. Many of the holes were his versions of famous holes from British courses, a pattern he would repeat on later courses. Macdonald would tweak the course for the rest of his life, altering every hole somewhat over the next 30 years. The course hosted the inaugural Walker Cup in 1922, and is considered a landmark of golf architecture even today. In 2005, Golf Digest ranked it the #9 course in the United States.